A couple of weeks ago we saw the dismantling of Ronnie ‘The Rocket’ O’Sullivan at the hands of snooker’s (not so young anymore) young pretender Judd Trump – a strange sight in Ally Pally, or anywhere for that matter. But had the match been played in any arena in the world, all other things being equal, the result would have remained the same. The snooker table doesn’t change. Ronnie O’Sullivan doesn’t change. The same can be said for a lot of sports. Usain Bolt running a world record in the 100m is still the same time wherever in the globe you are, and similarly anyone else’s effort can be measured against it accordingly. But when we have two golfers, playing on opposite sides of the globe, on different courses, with different set-ups, drawing direct comparisons is a harder task. In snooker a 147 is a 147, no matter where you are. But a win in golf, with the performance to match, can vary massively dependant on some of the simplest factors. Rickie and Dustin (that big we don’t even need their surnames) took the spoils on the PGA and European Tours respectively, but it’s difficult to draw comparisons on who played better last week. Dustin shot his blitz of a 61 on Friday, Rickie rolled with the punches on Sunday and both men ultimately got the job done. Had they been playing in the same tournament, who would have won though? We pitched a poll to the seasoned experts following us on Twitter; Had they played in the same event this week (and performed as they did), who do you think would have won? At the time of writing, the jury was in DJ’s favour – heavily – with him taking 71% of the vote. Fundamentally, it’s all speculation as exact comparisons can’t be drawn. But that’s not to say a more precise method of comparison isn’t available. Using our global performance indices, we can gauge the strength of the field each player was playing in and from there understand the true number of strokes gained in their performance. By adjusting the players performance to a strokes gained total relative to the field (i.e. their average – scoring average) and also adjust this based on the strength of the field vs. a benchmark worldwide player, we’re able to make the closest comparison possible. Using our models, the field at Phoenix was +0.82 strokes relative to the worldwide ‘average player’, compared to the Saudi International which was almost exactly average, at -0.01 strokes, despite having the world’s top three players. From here, we have a base from which we can draw comparisons between the players. 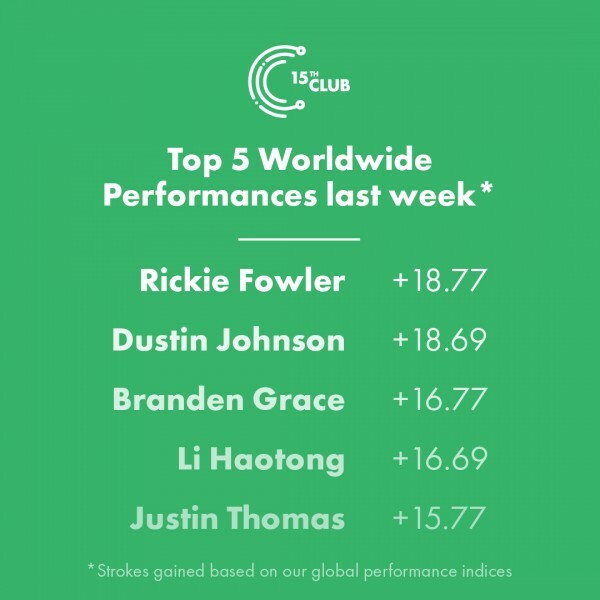 DJ’s 61 on Friday for example, gained him +10.23 strokes on an ‘average player’, with the next best round worldwide last week coming from Xinjun Zhang who gained +9.04 in Round 1 of the Bogota Championship on the web.com tour (which had a field of -0.60). Back to our twitter straw poll, and the answer driven by data not perception! Rickie and DJ’s performances were actually very closely matched; a lot closer than our followers would suggest. In fact, the 71% were wrong! Rickie’s performance when adjusted for the field, was +18.77 strokes better than the ‘average player’ compared to +18.69 for DJ. And some consolation for Branden Grace if he was wondering which event he should have played, had he put in exactly the same level of performance in Saudi, he’d still have finished 2nd. Nothing compares to a good healthy debate about the greatest sportsmen and women on the planet. “Who’s the best?”, “They wouldn’t have made the top 5 in my day!” I for one can’t name a dinner with friends that didn’t involve such comments. The ability to unite, divide and provoke thought, are just some of the reasons why many of us get anxious about the prospect of a weekend without sport. Armed with the most comprehensive and advanced golf database in the world, the only challenge I face is finding new guests for dinner! They are seemingly growing tired of debate ending analytics!